We made this simple name book as the introductory activity in the teacher workshop in Utah this summer. Each person had one sheet of copy paper with writing on one side, two covers cut from cereal boxes (for US Letter paper the covers were 3" x 4.5"), glue stick, scrap paper, and scissors. On each table was a pile of miscellaneous collage papers. A good way to place them is in styrofoam trays for vegetables from the supermarket. I led the class through the construction of the accordion book. Each person then cut the letters of her (or his) name out of the collage papers and glued them across the accordion. I like starting with this activity because it gives a taste of both aspects of bookmaking in one small package: following directions in the construction phase and independent creative work in the name phase. It also uses the accordion book as one long panel rather than separate pages and sends the message that book s can be places to experiment and have fun. We did a show and tell of our books and used them to introduce ourselves. We then hung them from a yarn line for some instant room decoration. You could also have branches in a container and hang the books. If you are doing it with a class, I think it's important for you to make a book along with the children. I think we need to take every opportunity we can to show our students that we are all in this together. We often forget that we are asking them to put themselves on the line every time they write something and share it and we need to acknowledge it and sometimes do the same. I thought this was the easiest to navigate (and no pictures of pregnant bellies as on the baby name sites). Susan means lily in Hebrew. Look up the most popular names by year as registered with the Social Security Administration. Susan was number 6 in the year I was born. In many cultures, name days are celebrated in addition to or in place of birthdays. My name day is August 11. Here's the wikipedia entry. Find your name day here. Interesting collection of information about names including babies, pets, hurricanes, companies, and more. Comic illustrations by Ted Stearns. in Italy name day is quite important, if you are Christian, of course, and it's celebrated almost like birthday (and it's easier to remember because you have calendars with the saint for each day of the year. Have you something about the names of the days? I find it a very stimulating subject! What a great idea, Susan! I even made one for my lengthy name--Patricia! A name book is such a fabulous idea. I agree with your comment about making something along with the children. I think it shows that the creative work they are doing is worthwhile because you are choosing to do it, too. I try to model my language in front of my small kids whenever I make something with them - "I like the way I cut out the letter K. Next time I would choose blue instead of green paper." 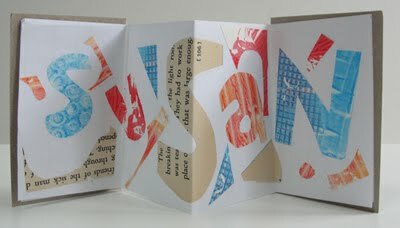 Thanks for the blog link - it's Book Week in Australia, and we have been making lots of books! We did this as a first activity in junior high art. Everyone loved it! What a kick! Love the name book as wedding card. What a perfect way to wish the couple well and I love the recycled connection. Thanks for the idea of the names of the days. I'll look into it. Any resources you particularly like?